The Panasonic NI-W810CS is a unique iron allowing you to operate in nearly every direction without having to adjust your device or struggle to get into position. The multi-directional Panasonic steam iron has pointed tips on both ends to make ironing easier and faster, and the company claims this unit is much more efficient by comparison to standard types. The Panasonic NI-W810CS has a double-sided tip that makes it easier to maneuver the iron and get it into small and tough spots of your clothing. This helps save time and effort on your part. This Panasonic iron steamer has a translucent water tank which makes it easy for you to keep check of your water levels. The temperature may not be enough for some fabrics. Materials such as thick linens and cotton require more heat to be efficiently straightened, but this iron may not be up for such a challenge. Some users in Panasonic steam iron reviews complain about this model being easy to knock over. Unlike a typical iron, this one stands on 3 legs. If you often knock against your ironing surface while working, you may need to look for something more standard. 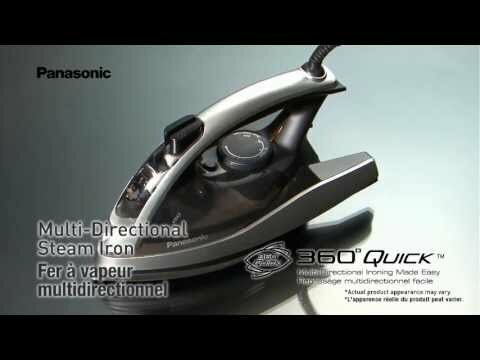 One of the most unique features of this Panasonic iron is its 360-degree multi-directional design. The elliptical shape of the sole-plate makes it easy to move the iron side-to-side or back and forth across your clothing without becoming entangled or causing cramps in your arm. This double-tip style prevents you from making new creases as you move the iron over your fabric as irons with a straight sole-plate often drag the fabric along as the iron moves across. Panasonic claims that this design can save up to 25 percent of your time compared to the time you would spend ironing clothes with the standard sole-plate shape. This saved time is the result of less passes needed to smooth out the clothing. The ceramic coating also makes it easy to slide across. The steam output is well-regulated and consistent without leaking for any setting on which it may be placed. Steam ports are located across the edge of the sole-plate, and there are none within the center to allow better distribution. The temperature is controlled via the designated knob, and it allows for 5 settings. The adjustable steam features 4 settings including one for dry ironing. The unit features a steam jet as well to eliminate the more stubborn wrinkles. This jet can also be used to clean the inside of the device for maintenance. The Panasonic NI-W810CS features a 360-degree rotating power cord, and it’s 8 feet in length. The unit’s water reservoir holds 6.75 ounces of water. Even with its low Panasonic iron price, this model offers the safety of 3-way shut-off protection. When left vertically standing, it will shut off after 10 minutes, and it powers down after 1 minute on its side. The Panasonic NI-W810CS may not have perfect features, but it is still one of the best affordable irons in terms of quality. Compared to many other low-priced models, it gets fewer complaints and offers many modern components. Its contemporary look coupled with its multi-directional shape make it a great choice for those aiming to stay within a set budget.